The film is set in Beirut, Lebanon, that is building towards a safe harbor for their citizens in a post-war era… especially the Palestinian refugees. But this is not without consequence, and it’s illustrated through a confrontation between a Christian Party mechanic and a Palestinian construction worker. What starts as an exchange of misunderstood insults, becomes a trial of the century, and a powder keg with a burning fuse for the broader opposing factions in Lebanon. Exquisitely acted and highly moral, the film creates human representatives for long-simmering resentments, and holds up that humanity to the light. Tony Hanna (Adel Karam) is a car mechanic in Beirut, Lebanon, who has never been happier. His wife Shirine (Rita Hayek) is expecting a child, and his domestic situation has never been calmer. He is watering the plants on his balcony when his broken gutter pipe pours water on a construction worker named Yasser (Kamel El Basha). Yasser is responsible for fixing it, and proceeds to do so without Tony’s permission. This causes Tony to snap and destroy the pipe, which causes Yasser to hurl a harsh insult. Tony demands an apology through a mutual friend, and the two men confront each other again, only to have Tony hurl an insult towards Yasser, one that motivates Yasser to punch Tony. When the details of this encounter becomes public knowledge in a court trial, the side representing Tony (Christian Party anti-immigrants) and the side representing Yasser (Palestinians) also begin to escalate emotionally, which could lead to greater conflict. The story is absorbing, because it is entrenched in a long journey of war and remembrance in the country of Lebanon. Their civil war lasted for 16 years (1974-1990), and the effects are still simmering and lingering. In summing up the clashes by starting with two men, the film exposes conflict at its basest and most emotional level. The men are human beings, but they are also living through a country/ideology, and are influenced through those artificial constructs. The understanding of the characters, and how they are presented, are the greatest strengths of writer (with Joelle Touma) and director Ziad Doueiri in balancing the story toward an outcome. Both Tony and Yasser have pasts that haunt them, and in showing those pasts both men have inner justifications, and roots in how stubborn they are. Kamel El Basha as Yasser has the calmest outer demeanor, yet his trigger point is Tony’s much discussed invective. 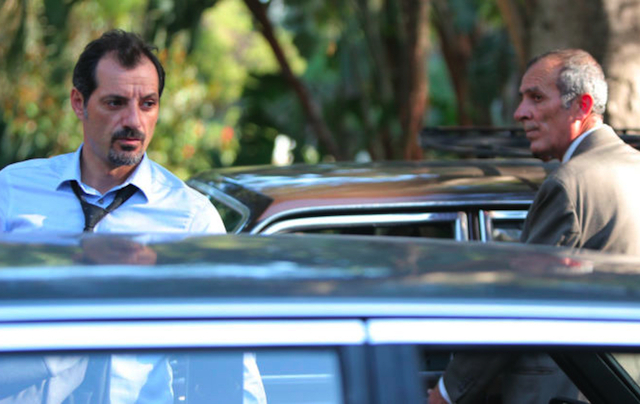 Adel Karam as Tony wears his emotions on his sleeve, and will not let go of what he believes is his due. Understanding both these men is to understand Lebanon. There is a bit of melodrama that weakens the narrative a bit. The trial itself conveniently becomes a face-off between a bulldog (and anti-Palestinian) prosecutor and his defense attorney daughter. This again brings home the conflict through human beings, but the coincidence wasn’t necessary, and distracting. Also throughout the film, Tony and Yasser find themselves alone together, and one such meeting plays out in a Solomon-like conclusion for Yasser in proving his case. As Woody Allen once said, the reason we create art is because we can’t get it right in real life.